A few months back, I bumped into Jim Kaat on the jam-packed concourse at beautiful Target Field in Minneapolis, just before the start of the All-Star Game. Jim was talking baseball with a few friends, and considering that he spent the first half of a 25-year Major League Baseball career with the Senators/Twins franchise, I am sure he wound up in the middle of a lot of other baseball conversations on that concourse before ever making it to his seat. Jim loves to talk baseball. Yesterday morning I got an email from Kitty (he is the earliest riser around), who said, “I’m in a blogging mood after watching the games last weekend.” That, to me, is always a good thing. Kaat is always insightful on baseball, and he never has been one to pull punches in saying what’s on his mind. Today, you can go to Kaat’s Korner and see what he thought of those four Division Series — including why, he says, Clayton Kershaw failure against Matt Adams had nothing to do with pitch counts and everything to do with simply failing to keep a breaking ball low. Go take a look and please leave some comments on his blog…I’ll make sure he sees them and we’ll see if he’ll do a Q&A here. Please welcome Larry Dierker to the MLB.com/blogs community. He just saved his first post at Dierk’s Dugout. The longtime Astros manager and pitcher commands a lot of respect among baseball fans and especially folks around Houston. See what he has to say about the Astros’ 2013 move to the AL West. Please be sure to leave Dierk some comments and questions so he can comment back. He’s using the WordPress.com Dashboard just like you and me, and so does fellow former pitcher Jim Kaat. Two words: Hot Stove. It is the same year-round blog at mlb.mlblogs.com that is maintained by MLB.com reporters, and it heats up before the Trade Deadline and throughout the Hot Stove season. This is the best source of buzz, from the only network of 30 traveling MLB club beat reporters — plus an army of other contributors from around MLB.com. Please be sure to follow it by entering your email. Tracker is here. Alden Gonzalez sits right next to me here at the Major League Baseball Advanced Media HQ in Manhattan, and I can personally attest that he just hit “Publish” on a post about his conversation with Jerry Reinsdorf. See what the White Sox owner has to say about realignment and playoffs, and please be sure you are subscribed as a regular follower of Alden’s Gonzo and ‘The Show’ — always good insights. I just posted a review to our official MLB.com Books Blog. See what you think and remember that anyone can add a review to that blog. Got a baseball book that you just read and want to review it? Either leave the review in comments here or let me know and we can post it there for you. If you’re a baseball book author and want reviewed, give a heads-up here also, please. If you don’t have an MLBlog of your own, then what are you waiting for? Go to MLB.com/blogs and start your own — it’s easy! Got any questions about MLB.com blogging? Want more people to see what you’re posting? Always leave tons of comments here and remember to type your full URL as an obvious breadcrumb back to your blog. See you in the next MLBlogs Latest Leaders at the start of December! 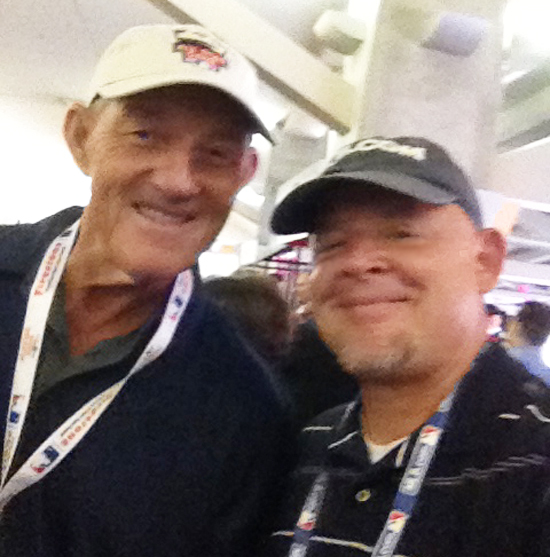 Want to wish 2012 Hall of Fame candidate Jim Kaat a Happy 73rd Birthday? Just go to his comments on his MLBlog and tell him. Kaat, winner of 283 games, just four fewer than 2011 inductee and fellow longtime Twins pitcher Bert Blyleven, is looking forward to hearing from his blog readers. Stop by Kaat’s Korner now!